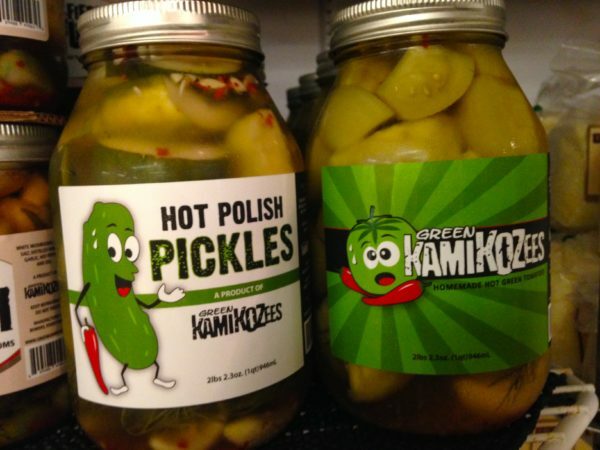 When Jeremiah and Katelyn Kozlowski of Green Kamikozees headed to the 2011 Chile Pepper Food Festival in their native Bowers, PA with 700 jars of spicy, pickled green tomatoes, all they knew was that they had done a lot of hard work. They had decided to spice up a classic family recipe handed down from Jeremiah’s Polish grandmother, who never wanted to let anything—even her garden’s green tomatoes—go to waste. Jeremiah’s grandfather would bring the pickled tomatoes to the Plymouth Meeting fire station where he worked, and his co-workers would flock to get a jar. Then Jeremiah’s father started pickling green tomatoes and bringing them to his own workplace. People loved them. Still, Jeremiah thinks his family might have wondered, “what if it’s just us?” Would others beyond family and friends like the pickled tomatoes too? Jeremiah and his family decided to take the plunge and see if a spicy remix of this family favorite would resonate with a wider circle. The Chile Pepper Festival was the first test. 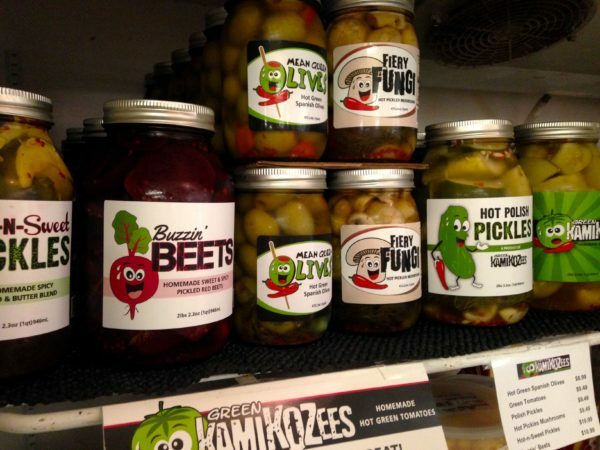 At this point, no one beyond friends and family had sampled the Kozlowski’s pickles, so even though they were hopeful, they knew they might be left with some jars at the end of the two-day event. As the big day neared, the amount of work involved was “eye-opening,” says Jeremiah. They had canned their own green tomatoes before, but never on this scale. Sterilizing 700 jars was daunting in itself! After sterilizing the jars, prepping the veggies they had grown themselves, and filling and sealing the jars, they weren’t done. They then had to label all 700 of them. On the first day of the Chile Pepper Food Festival, they sold almost all 700 jars. As people sampled, they appreciated the crunch, the freshness, and the level of spice. The pickled tomatoes are “hot,” says Jeremiah, “but not stupid hot.” Some customers noted that their great grandmothers had made pickled green tomatoes, but they were not as nice and crunchy. The second day, the Kozlowskis arrived at the festival with the 20-50 jars they had left. It turned out to be gorgeous weather, and Jeremiah has a hunch they could have sold another 700 jars. The jars they did have left sold out fast. With a reception like this, they decided they would officially launch a business to sell their product, but they’d keep their day jobs and make the products during the evenings and weekends. Soon, Green Kamikozees had eight products. They began to sell them at Zerns in Gilbertsville and Renninger’s in Orwigsburg. 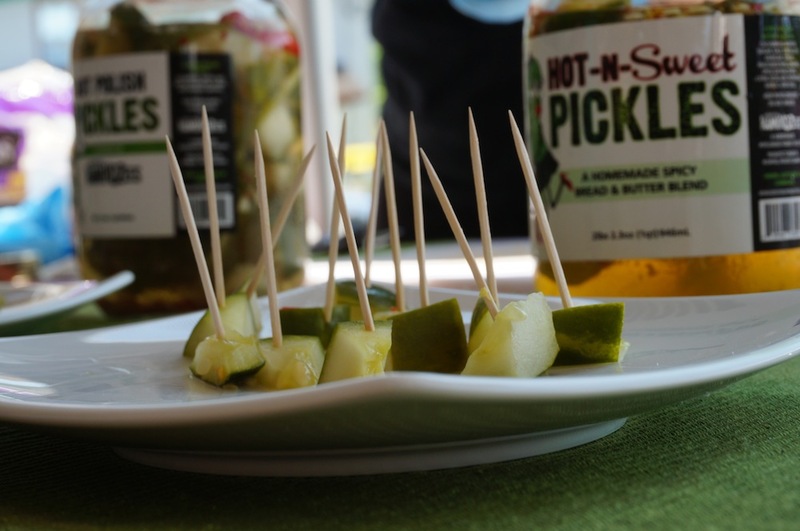 The next year, they increased their product line to 16 different types of pickles with varying levels of spice. Green Kamikozees are now sold at 50 markets. They have 18 products— from green tomatoes and pickles to spicy beets and even spicy cashews. Since they’ve expanded beyond what they can grow in their own garden, they look to three Mennonite farms “a stone’s throw away, to partner with us,” says Jeremiah. The Kozlowskis love to work with all natural ingredients from these local farms. Jeremiah is proud that they don’t cut corners. As evidence, take the fact that the Green Kamikozees use domestic garlic, which can be four to five times more expensive than imported garlic. As they launch new products, they make a lot of trial jars and seek the family’s input. Just this past Mother’s Day, as the Kozlowski family gathered to celebrate, they sampled some jars of a new product together and gave feedback on the recipe, asking questions like, “Do we want three garlic cloves or two?” Choices like this matter, and the Kozlowskis work to get it right. And when it comes to spice levels, “you’re at the mercy of the hot pepper,” says Jeremiah. Anyone who has made anything with hot peppers—whether salsa, pickles, or a favorite curry—knows that peppers can vary in intensity. The Kozlowskis strive to “keep the consistency of the heat.” They have the method down, and the fact that they don’t have product sitting around for a long time helps, as spice levels can change the longer a product sits. Jars are “almost made to order,” says Jeremiah. Since that intense lead-up to the chile festival, The Kozlowkis have streamlined their procedure, though each jar is still homemade by hand. It’s a lot of long nights and busy weekends, but since Katelyn’s graphic design work can now be done from home, she handles the Green Kamikozees’ online orders and preps for production in the licensed kitchen at their home. Summers, too, always mean that Jeremiah gets a break. He teaches third grade in Wyomissing and turns his attention to the pickling business full-time during the summer. Even when the schedule is hectic, Jeremiah likes it that way. His family likes to work hard, he says, because they have that homegrown, immigrant ethic. “If it was easy,” he says, “everyone would be doing it,” so the hard work makes their product stand out. He also likes that the business isn’t solitary but that his family can be involved. Jeremiah and Katelyn have three daughters, who take pride in the family business. Come meet the Kozlowski family at Taste of Weaver’s on June 3, 2017 from 10 a.m. to 3 p.m. Just like at the Chile Pepper Food Festival, the Kozlowskis will have free samples!